It's dangerous world out there! Storms, earthquakes, explosions, vandalism... both natural and man-made disasters are on the rise worldwide, unfortunately consequences to people and property can range from unsightly to costly or even deadly Help protect all your precious resources, human as well as financial with MAYA security window films. 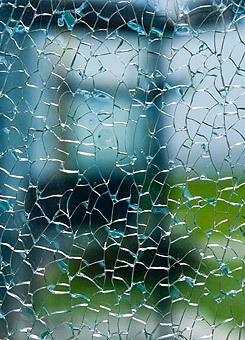 Global studies have shown that 73% of injuries occurring as a result of these incidents are caused by the fragmentation of the glass in place. Therefore the use of Safety and Security Window Films which are placed on the glass from the inside make them the first line of protection for people and property during accidents. Bomb blast and severe weather: help reduce damage and likelihood of injury from flying glass. Forced entry: Make it harder for thieves to smash and grab retail display merchandise. Architects, building owners and facility managers trust MAYA to secure treasured buildings and artifacts as the UN organizations, ICRC and lots of the embassies and other official government facilities.